The destitute, of Banchharampur upazila under the district, became delighted as they got interest-free loan from Bashundhara Group, country’s leading business conglomerate. Adviser and Treasurer of Bashundhara Group, also Publisher of the Daily Kaler Kantho, Bangladesh Pratidin and Daily Sun of East West Media Group, Moynal Hossain Chowdhury presided over the 30th loan distribution programme in Banchharampur on Thursday. Bashundhara Group’s stipend to meritorious students is also helping to enhance the quality of education, he added. On behalf of the people of Banchharampur, vice president of upazila Awami League MA Awal congratulated Bashundhara Group chairman for distributing interest-free loan. Deputy General Manager of Bashundhara Group Maimun Kabir, manager of Agrani Bank Banchharampur branch Badiul Alam, lecturer of Banchharampur Degree College Kaiser Ahmed, In-Charge of Bashundhara Foundation Mosharraf Hossain among others addressed the programme. On the other hand, loan receivers also told their success stories. In the 30th loan distributing programme, around Tk 50 lakhs was disbursed to 589 members among whom 48 were new members. Chairman of Bashundhara Group Ahmed Akbar Sobhan established ‘Bashundhara Foundation’ in 2005. The Foundation has been giving loans in 33 sectors including small enterprises, animal husbandry etc. At present, 72 villages of 11 unions among 13 unions of the upazila are under the programme. 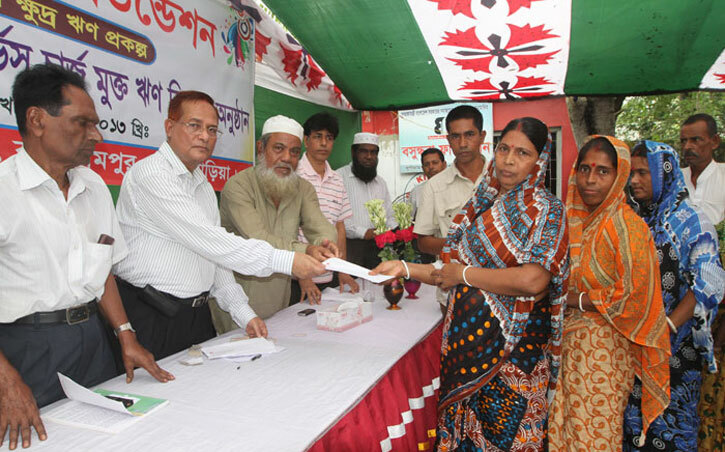 By the September of 2013, Bashundhara Foundation has helped 7,756 families with the loan. It has distributed around Tk 4.84 crore among the members in a rotation system. Moynal Hossain Chowdhury said that they have a plan to cover the whole upazila.